Runners at the Lagos City Marathon 2017 (Photo by Israel Ojoko). The 10km race will be introduced in the next Lagos City Marathon scheduled for February 10, 2018. 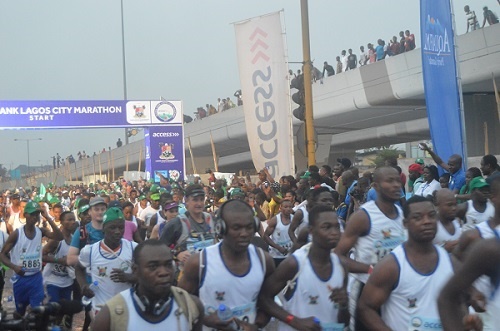 Athletes are beginning to intensify preparations for the 2018 Lagos City Marathon as there are indications that winners of the men and women's 10km race will be handed brand cars. The car will be given by the race’s Official Automobile Partner, GAC Motor. Sonia Audu has done a couple of marathons and half marathons but she has started training for speed because she wants to win a car from GAC Motor. “My cousin works in the company and she told me they are giving away two cars to Nigerian men and women winners of the 10km race. I have seen the cars, they are beautiful, and I will love to drive them. In fact, I have changed my training. "Before, I trained for endurance because I want to finish 42km but now, I am training for speed because you need to run fast to win the 10k. The world best time for women is about 30 minutes but that is by a Kenyan. If I can run 40 minutes, I know I will win the car and I thank God Kenyans and other foreigners will not be allowed to run the 10km," Audu said.